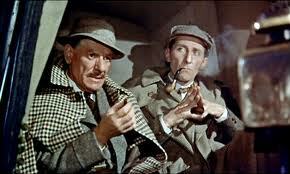 The first time that Sherlock Holmes and Dr. John Watson were ever filmed in color was in 1959 by Hammer films. The story was “The Hound of the Baskervilles”, the most frequently filmed story of the canon. So far I know of 28 filmed versions of the story, there may well be more. Sherlock is played by Peter Cushing and Dr. Watson by Andre Morell. Hammer was strictly B movies but hit the jackpot in the ‘50s with a couple of horror flicks. Even they didn’t understand the success and so they commissioned a survey of audiences to find out what people liked best about their movies. They liked being scared! What better to scare you than the “Hound from Hell”? perspective of the year in which it was made, long before computerized special effects. Like all of Doyle’s stories it needs some padding to extend the tale to a full length movie. So there is the addition of killer tarantula spiders, an old mine shaft from which Holmes must escape, and a horrible ritual sacrifice. All these pieces are worked in fairly well to the story. There are some changes in the characters, as usually happens when things go to film. Where you can have many characters in a book it can be confusing in a film of limited length. I won’t explain them for they will be obvious to the reader of the Holmes stories. 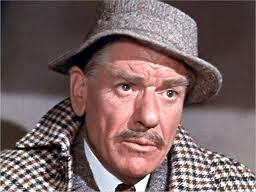 Andre Morell does an exceptionally fine job as Watson. He is very true to the character, strong independent and intelligent. Morell and Cushing work very well together. Cushing played Holmes perhaps a little more low key than the Holmes of the books. Andre Morell was born in London on 20 August 1909. His birth name was Cecil Andre Mesritz but he had it legally changed in 1938. He moved from being a motor mechanic and amateur actor to professional actor in 1934. Until his death in 1978 he would find constant work in theater, movies and television. He is one of those actors you see all the time in films and ask yourself “what’s his name?” His voice is quite unique and carries that tone I always associate with a senior officer. He was a member of the Old Vic theater company and was well known for his abilities with Shakespeare. In WWII he served in the Welch Fusiliers through 1946 and attained the rank of Major. Three of the films he appeared in are among my favorites. Two received Best Picture Academy Awards: Bridge on the River Kwai and Ben Hur. The third movie was his last, The Great Train Robbery with Sean Connery. Morell had a tremendously positive reputation for hard work and attention to detail, resulting in superb performances.